The maroon beret is a symbol and pride of special forces. However, in order to obtain a maroon beret must pass a series of difficult challenges, proving their physical and psychological preparation. The maroon beret is not only a headdress, but an indicator of high level of training of the officer. Each year the soldiers of the special forces pass the exam in order to prove the ability to overcome difficult tests. To pass the exam for wearing a maroon beret can any soldier serving on contract or call. 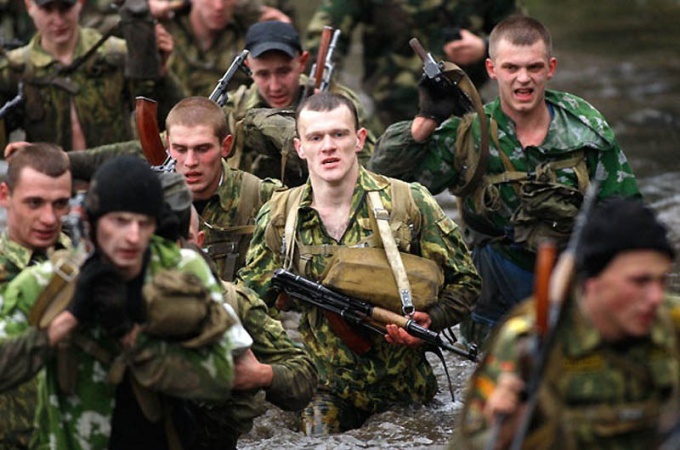 It is necessary to serve in the special forces for at least six months, receive a positive response from the commander and have excellent grades in academic subjects. A preliminary test is performed 2-3 days before the main exam. It consists of Jogging for 3 km, pull-UPS, and test, which involves lying down and my burpees, pushups, exercises on the abdominal muscles, jumping up from squatting position. All of these exercises are repeated seven times. In one day the candidates need to overcome seven challenges: a March, special obstacle course, preparing for the assault of tall buildings, acrobatics and unarmed combat. The first phase of testing is March. A prerequisite is the overcoming of water obstacles. Depending on the commander's order may include fire, evacuation, overcoming different kinds of obstacles and blockages, exercise. The total time allotted for March, is set based on weather conditions and terrain but should not exceed more than two hours. The next step is to overcome the obstacle in extreme conditions. It is executed immediately after a forced March without rest. The band are set charges and products RDG-2B. It is obligatory to smoke the obstacle. The third phase of testing includes high-speed shooting against the fatigue of the body. The time allotted for shooting is no more than 20 seconds. To accomplish this, special exercises candidates go on the firing line. The fourth stage consists of the assault of tall buildings using rappelling equipment. The fighter starts test from the window on the fifth floor. The team commander begins to descend. Reaching the window on the fourth floor, he is obliged to make several shots from the machine. In the opening window of the second floor should knock the leg frame layout and can throw a grenade. Then down to the ground. The control time of the test shall not exceed 45 seconds. In the fifth phase, applicants must fulfil a set of acrobatic exercises. It includes: kick kicking with the execution of the somersault and front flip from a springboard, lifting the body from the supine position. This is followed by a stage of performance of a complex of special exercises. The subject requires the proper execution without errors and stops in sequence, and high quality beats. The final stage involves hand to hand combat. The training bout lasts no more than 12 minutes without interruption, with change of partners. Having passed the test shall be the one who was active and didn't get the knockout. In part, you will create a special Commission to assess the behaviour of applicants. In all tests, it receives credit or fail. After receiving a poor evaluation of the applicant is removed from the competition. All applicants received a rating of "pass" on all tests receive a long-awaited green beret. Headdress is an indispensable attribute of military equipment. In inclement weather it protects from the rain, in the cold – saves from the frost. But there is a special headgear, the wearing of which becomes, for a warrior, a symbol of belonging to the elite. These include and maroon beret. To earn it, a soldier has to go through serious trials. Being a standard element in uniforms, berets have become popular in the armies of different countries of the world. They often have a certain color, which can be attributed to the owner of the beret to a specific kind of troops or special forces unit. Such headgear is often the army special forces and other elite units, such as, air force or Marines. 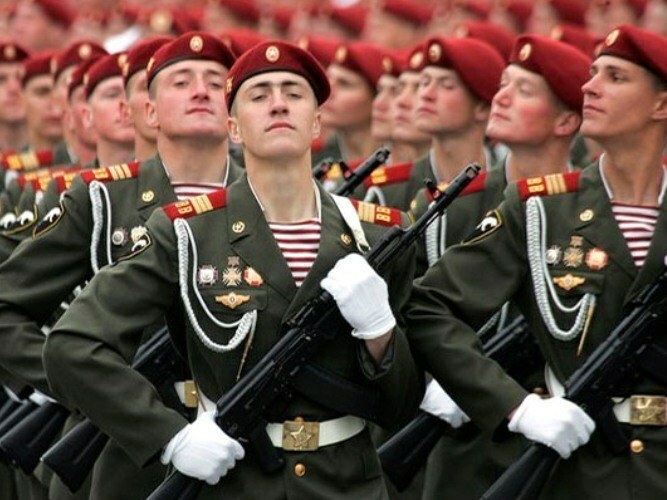 Dark red beret appeared in the Soviet Union in the late 70-ies of the last century, when it was formed the first special forces unit in the division named after Dzerzhinsky. Maroon beret almost immediately it became not so much an attribute of the uniform as sign of the highest professional qualifications of its owner. Such a headdress is dedicated to finding the commando from a distance. Today, the maroon berets are worn only by those fighters of special forces within the structure of interior Ministry troops, which have proved their right to this distinctive sign of his physical training, professional skills, moral and volitional qualities. To be eligible for wearing this headdress, it is required to pass special tests. The right to wear the elite maroon beret are only those special forces soldiers who went through the ordeal. That privilege goes through pain, sweat and blood. The regulations on tests approved by the commander of the internal troops in 1993. The exam consists of two stages. First there is a check on the results of special training. The applicant for wearing the maroon beret have to score maximum points in all major types of combat training. Thereafter shall be the main test of the event. Soldiers making a forced March, and overcoming the most various obstacles. The applicant will also have to withstand a duel with his superior force of the enemy. Rules of carrying out single combats rather rigid, and therefore the battle can be considered as close to real conditions. Melee it, perhaps, represents one of the most serious of trials required to obtain the coveted qualification. Statistics show that honor to wear the dark red beret awarded at the end no more than a third of applicants. The presentation of the headdress of the special forces takes place in a festive atmosphere. Taking this symbol of courage, a soldier falls on one knee and kisses hat. Even renowned special forces soldiers are experiencing this moment of particular excitement.